Last month the Voter Fraud billboard had just the opposite effect the "private family foundation" - who purportedly paid for the billboard - wanted the message to be. So, before the November 6th election, Clear Channel, seeing that their hate speach was having the effect of mobilizing democractic voters (instead of intimidating black and hispanic voters), pulled the sign(s) down. 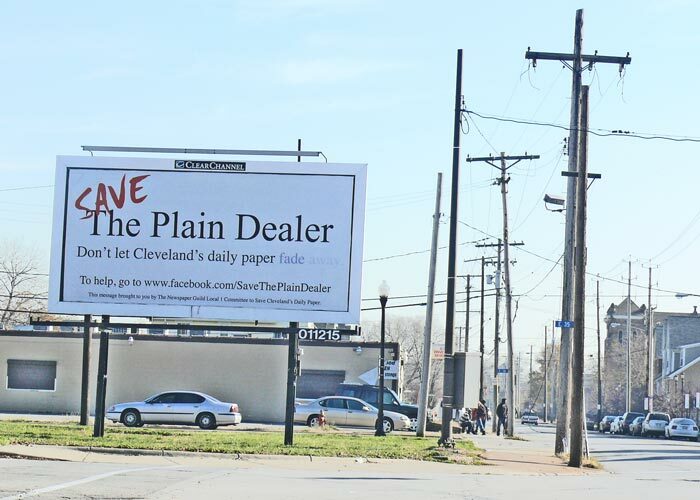 The Plain Dealer union's will find that their "fade away" expenditure on this bill board is similarly wasted. It's too late you guys. And, amusingly, while you are out buying bill board signage, you are still missing Satinder Puri! If the Dirty Dealer unions had advised Advance Publications just to hire Engineer Satinder Puri to help put the paper back into a state of community relevancy, then the Plain Dealer would see first hand how a proper grass roots media campaign was operated. In NEO, many people's first instinct is to go after the Dirty Dealer for the news corporation's ineffectual-blind-to-the-overwhelming CorpSport, GPC and Charitable Establishment influence. Personally, the Dirty Dealer is about 10 years past ignoring. New media. New Energy. New Honesty. New street level passionate jouralism is here. Satinder Puri's all court Save John Marshall High School global media press makes the Dealer's union-paid bill board effort to survive look like a glogged vacuum cleaner. Jeff: Thanks for the plug. Submitted by Satinder P S Puri on Mon, 11/26/2012 - 23:50. Jeff: Thanks for the plug. Also, I would work for them for free -- ever since I retired -- I only do voluntary work. Submitted by Jeff Buster on Tue, 11/27/2012 - 23:40. I think to myself - Hunger Strike? - not really a western thing I'm familiar with. I say to my friends: This guy is talking about a hunger strike. In Viet Nam the Buddists immolated. And, gristly, it made the irises of lots of Americans blink. Sick. Healthy. People have to melt into fire to get our attention. A Hunger Strike in Cleveland? A different type of civil messaging.